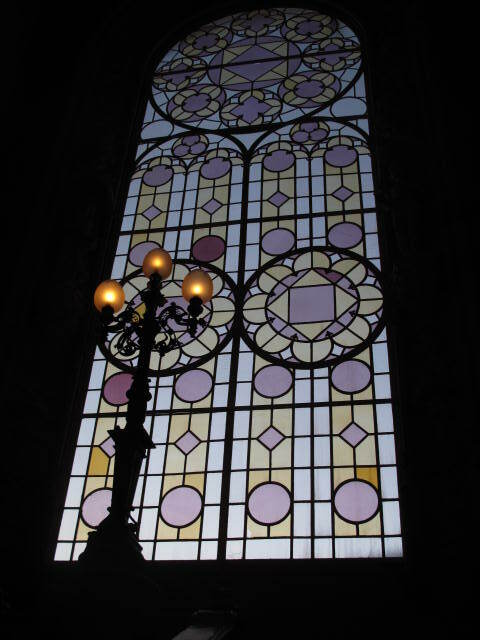 Located an hour’s drive south of Oporto and betwixt the Bairrada and Dao regions, I’ve stayed at Bussaco Palace Hotel en passant, checking in late and checking out early in and amongst visits with local wine producers. My fourth and fifth visits, however, proved rather special, for the hotel itself is famous for its wine and, being a member of Baga Friends, it was the ideal spot to pay homage to the Baga grape variety. Cue a vertical tasting of Bussaco Palace Hotel’s unique and rare wines, also a selection of wines, old and new, from its Baga Friends (which I’ll write up separately). Bussaco the palace and place has a pretty colourful history too. The towering forest surrounding the palace was home to a Benedictine convent and, in 1628, Barefoot Carmelite monks built a walled monastery which was also to serve as a retreat for King Joao V’s illegitimate sons and the Bishop of Braganca among others. Caught up in the Peninsula War, Bussaco was the scene of a great Anglo-Portuguese victory over Napolean’s army, who might have been well advised to beat a retreat. And war, this time civil, took its toll in 1834, when the monastery was nationalised. 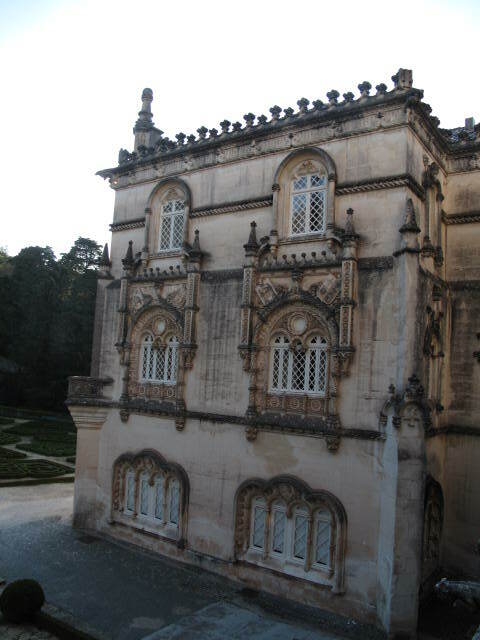 By the late 19th century, the region had become a holiday retreat for the wealthy and, in 1888, a decree was issues for a royal palace to be built in Bussaco forest. But those plans never came to fruition and, instead, Bussaco Palace Hotel was built. Under Alexandre de Almeida’s rigorous eye for detail, by the early 20th century, it had become one of the highest ranked hotels in Europe. The hotel is still run today by the de Almeida family who, specialising in historic hotels, are keen to preserve its individuality. 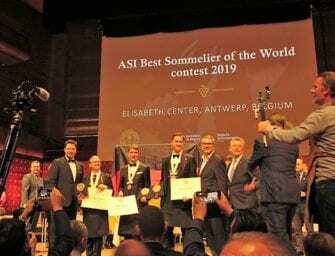 It’s a quality which you’ll have gathered extends to the wine and while both hotel and wines have a sense of faded glory about them, they’re still going strong. And expect them still to be here when the bell has tolled for more faddish hotels and wines. Alexandre de Almeida’s grandson, also called Alexandre, attended the tasting and told me his grandfather envisioned the hotel as “a cathedral of wine” to show off the region. 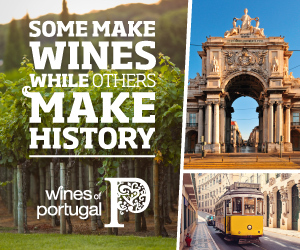 It was he who produced the first wines, which are made from grapes sourced from the hotel’s own vineyards as well as local growers in the Dao and Bairrada. Reservado reds are a blend of Bairrada Baga and Touriga Nacional from the Dao; Vinha da Mata – a single vineyard red – is more focused on Baga (65% of the blend) because the vineyard is on Bairrada’s chalky clay soils. Whites are a blend of Dao Encruzado with Maria Gomes and Bical from Bairrada. 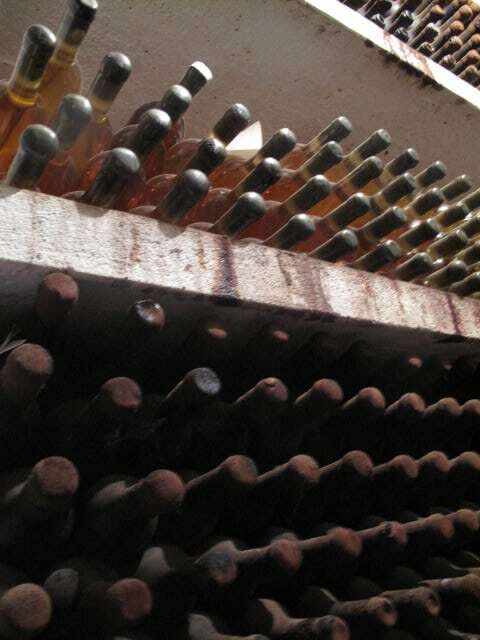 Winemaking is traditional, with fermentation in lagares (typically with 50% stems for the reds) and extraction via foot treading. 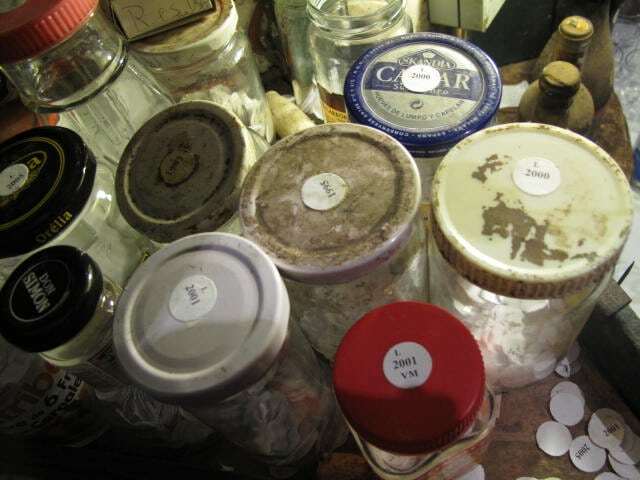 Everything is done by hand and I was touched by the vintage labels, seemingly typed on a dot of a sticker and stored in old jam jars and the like (pictured). 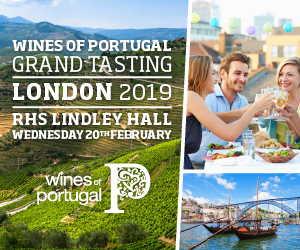 De Almeida told me the wines used to be labelled Bussaco Reserve Especial but a change of rules required wines labelled Reserve to undergo a tasting panel. Instead, the hotel cheekily sidestepped this ”red tape,” changing the name from Reserve Especial to Reservado. 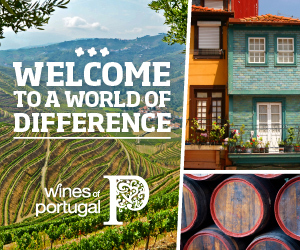 Once bottled, the wines used to be aged in the hotel’s cellar for 3-4 years in large barrels (toneis) made of Bussaco oak or chesnut, Brazilian oak (Macacauba) and mahogany, then in bottle (3 years for the white, 4-5 years for the red). 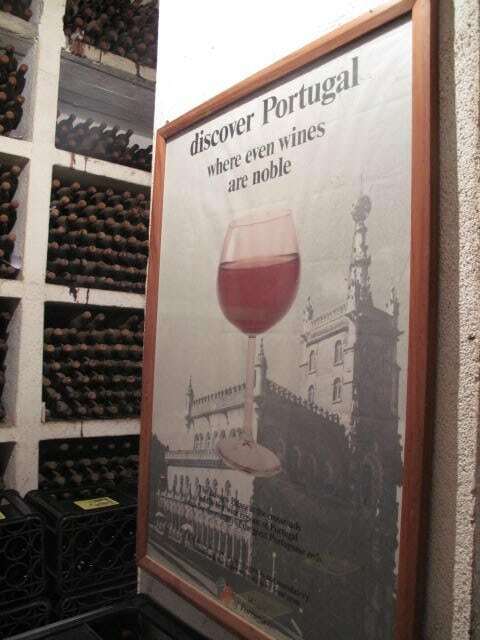 However, because there was no-one to take care of the toneis, since 2000 the wines have been aged in smaller (300l) oak barrels, with a percentage of new oak (although Vinha da Mata is aged 100% in new oak for just 12 months). I’m told that the atmospheric cellar is home to over 60,000 bottles, dating back to 1920. The wines are exclusive to the de Almedia hotel chain and you’ll find the 1944 white and 1945 red on the hotel’s wine list! 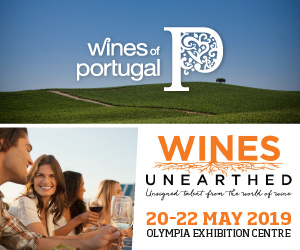 On the flight to Portugal I was tidying up my notes from Brokenwood’s 40th anniversary tasting and, I must say, the Bussaco wines had no little resonance with Australia’s Hunter Valley Semillon (just check out my notes of verticals of Brokenwood’s Semillons here and here). Both wines have the acid structure for long, long ageing, though I reckon the coffee note I picked up in the Busacco wines reflects the wines’ time in wood. (NB The notes in italics are from my fifth visit in March 2013, when I tasted new vintages, different back vintages and re-tasted some of the older wines). Bussaco Branco Reservado 2010 – a lifted pine needle nose with a salty edge which follows through on a textured but vibrant palate with a lively thrust of limey acidity to its white peach and (surprisingly) more tropical pineapple notes. There’s a hint of (new oak) white chocolate too. Youthful and the most primary, ripe vintage I’ve tasted. Bussaco Branco Reservado 2009 – a gentler style, creamier, with peach, (orchard) fruit salad and a hint of nougat. Good. 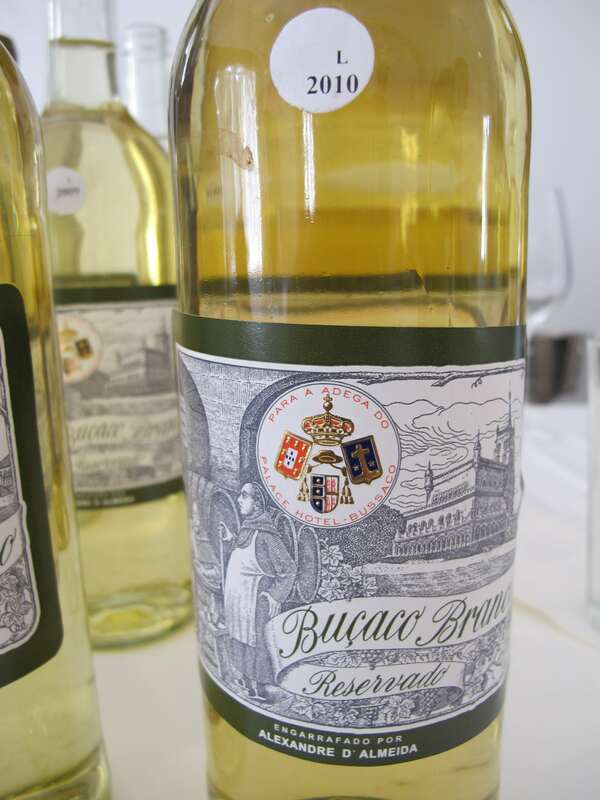 Bussaco Branco Reservado 2008 – a subtly spicy nose and palate with sweet ripe lemon, fresh and vanilla poached pears. Very well structured, fine and pure with tight, lemony acidity. This vintage has yet to be released. Great potential. A second bottle of the 2008 tasted in 2013 looked and tasted quite evolved – yellow gold, with a pithy palate which lacked purity. Bussaco Branco Reservado 2007 – much less pure than the 2008 with a smoky quality to the nose and palate, porcini and earth. There’s good underlying lemony acidity which brings drive and freshness, though it remains a little fuggy. Bussaco Branco Reservado 2005 – showing some biscuity, savoury evolution with dried herbs, smoke (flinty not fuggy) and orange peel as well as more primary grapefruit and fleshier peach (very Bical). 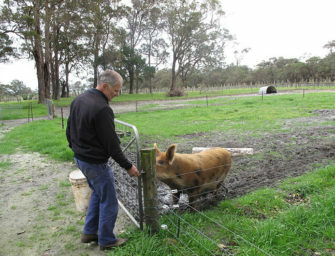 A strong current of acidity reminds you this is a youngster. Very good. Bussaco Branco Reservado 2003 – with several years under its belt this is showing some exciting complexity. There’s a resin note I associate with Encruzado, lemon peel, lanolin/oilskin and hints of honey. A tight acid backbone brings length and purity. Very good. A second bottle tasted in 2013 was also in fine form, showing peach skin and flesh, lemon peel, amaretti biscuits and a hint of pine needles. 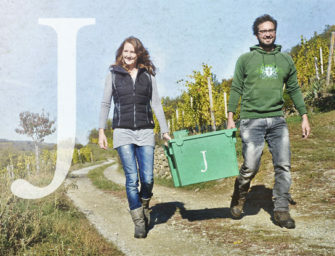 Lovely fruit weight and expression, its ripe Sicilian lemon acidity round and well integrated. Bussaco Branco Reservado 2002 – darker and significantly more evolved on nose and palate with that fuggy smoke and biscuity quality I picked up in the 2007 as well as pot pourri (which I tend to find in more aged wines) and resin. In comparison with the others it seems quite “thick” or muddy on the finish. Bussaco Branco Reservado 2001 – plenty of interest and complexity here with roast peach, macaroons, beeswax, smoke and lanolin on a well structured palate with good freshness. Seemingly bigger/warmer than others, so while it shows good depth and layer, it lacks a little line and finesse. Maybe I’m just being harsh in comparison with my favourites! And it would seen I may have been harsh, or at least this bottle tasted in 2013 was better, with delicious rolling acidity and succulent nougat and cinnamon-edged white peach. A tapering finish with a hint of lanolin/oilskin is long and lingering. Just lovely. Bussaco Branco Reservado 2000 – and this is a favourite, with a still vital, compelling nose which shows ripe citrus zest, grapefruit and peach which follow through on a long, persistent and perfumed palate, with aromatic peach tea, fuzzy peach skin and tertiary oilskin too. Terrific. Tasted again in 2013, this golden yellow wine seemed quite forward – very creamy, with buttery pineapple and buxom fruit. A little heavy; warm too (alcohol) on the finish. Bussaco Branco Reservado 1985 – deep orange – the colour of Lucozade bottles – out of condition with a musty nose, volatile boot polish notes and rotten peaches. Bussaco Branco Reservado 1978 – takes me back to the eighties with its nose of Maxwell House (instant coffee). There’s nutty macaroon notes too which persist on the resin nuanced palate which yet retains remarkable freshness. Intriguing! And the Maxwell House coffee note remains in 2013, with chicory kelp and iodine; still some peach. Though there’s rolling acidity to the finish, the flavours are drying out a bit so it finishes short. Bussaco Branco Reservado 1967 – antique gold with a real patina of age to nose and textured palate too, with layers of coffee, fenugreek/chicory and earthy, fern-like notes as well as buttermint and moldy orange peel. Fading, with a quite short finish. Re-tasted in 2013, this bottle is very pungent on the nose, initially showing neat iodine, which follows through on a bone dry palate. Opening up, there are traces of peach but it remains an unforgiving wine; past its best. 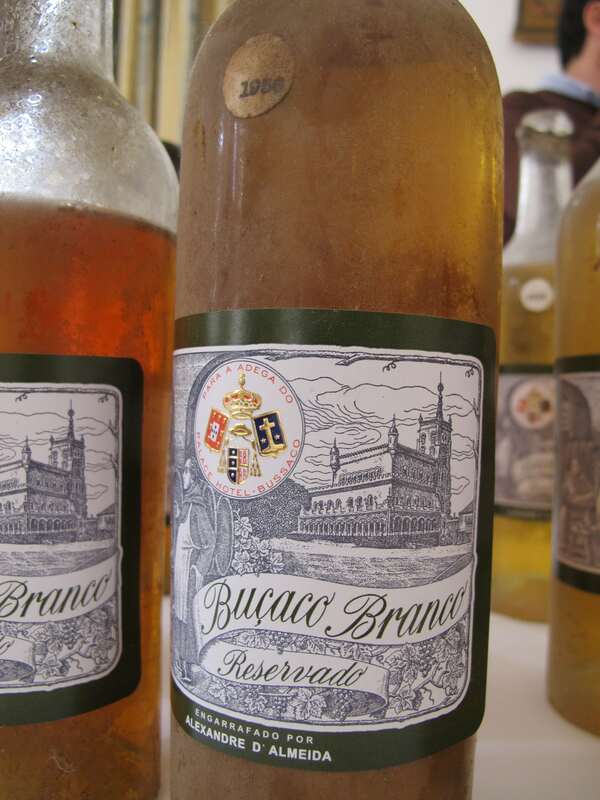 Bussaco Branco Reservado 1956 – on the other hand, this wine retains a vital, pulsing core of acidity, which animates it peach/peach tea/peach kernal, dried herb and coffee notes. A nutty/marzipan edged finish is firm and just a touch bitter, which detracts a little, but hey, at 55, I think it can be excused! This wine still impresses for its age in 2013. Though deep golden/orange, it has a real flor (and lily flowers) character to the nose; a smokiness and hint of marmalde too. It becomes peachier as it opens up, with a pronounced peach tea character. Very complex with nutty amaretti biscuit nuances, honey and candied citrus, the whole leavened by a delightful wash of mineral acidity. Bussaco Branco Reservado 1955 – deep orangey gold, with amaretti biscuits, roasted peaches, chicory and a hint of coughsweet/coltsfoot. It’s very spicy and a little dusty on the finish. Still, impressive fruit retention and structure for its age. While the 56 gets better as it opens up, the 55 re-tasted in 2013 fades in the glass. Initially very spicy with an earthy, biscuity/tufa/raw porcini edge, pine needles/resin and arrowroot to its ghostly white peach fruit, rotten tangerine peel notes make for a bitter, dry, faded finish. Bussaco Tinto Reservado VM 2010 – this single (Bairrada) vineyard wine (VM stands for Vinha da Mata) is a very deep, bright hue with no difference between rim and core – colour-fast! The fruit is very concentrated with an attractive pippinness/vibrancy. The tannins are very firm – again quite pippy (fruit?) 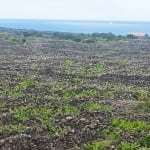 tannins. Youthfully austere, it has the fruit concentration and purity and tannin structure to age gracefully. Do not broach for five years plus (and will keep for much longer). Bussaco Tinto Reservado 2007 – a very deep hue. The Touriga Nacional component asserts itself on the perfumed, floral nose. In the mouth, it has an aggressive, sour quality. Not sure where this is going? One to review. Bussaco Tinto Reservado 2006 – a subtle nose and not so subtle tannins – indeed, fierce on the attack, though thankfully overridden by the juiciness and saturation of its fruit so ultimately they’re not drying. Hints of coffee grindings edge its well-defined black and red fruits, including pithy pomegranate, which finds echo in those bony tannins. Very promising give it another 3-5 years and keep for much, much longer. 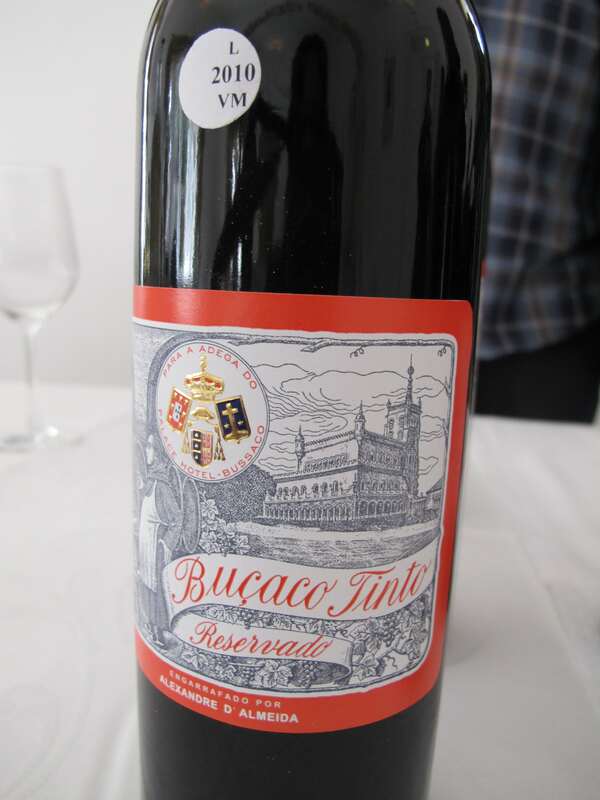 Bussaco Tinto Reservado 2005 – my, this is good, so much more approachable with ripe but present tannins – very 2005. Sensual even, with a lovely, deeply floral nose of rock rose and incense spice, which heady perfume infuses the palate, together with spicy liquorice. Long, long, this wine has an ethereal cathedral-like quality, such is it lift, presence, dimension and genuflect-inducing powers. In 2013, the 2005 still impresses with its soaring (Touriga Nacional) aromatics and swooping, swoonful mid-palate of fleshy red fruit and dark chocolate-edged sour cherry. The Baga really firms it up, lending length and line. Despite the floral lift, the finsih is precise. Excellent. Bussaco Tinto Reservado 2004 – much less concentration here – what a varied run of vintages…This shows ripe plum on nose and palate, a touch diffuse, with a hint of bloodiness, tar and roses. Plesant enough but nowhere near the presence of the 2005 or the vigor of the 2006. Bussaco Tinto Reservado VM 2001– “VM” is a specific parcel of vines which, in good vintages, is vinified seperately. With its perfume of dried spice (cinnamon and clove) and lovely saturation of juicy small berry fruit it puts me in mind of the 2005, though there’s a good deal more corsetry of the super-tight whalebone variety (not that I’d know from personal experience I might add!) All of which means, while the 2005 is broachable now (and will last a couple a decades +), this would most definitely reward even more patience – 2-3 years at very least. With its firm but ripe backbone of tannin and impressive definition and length it will be magnificent, holding its shape while revealing a little more itself for many years yet. Yes, patience is still required with this the first VM. Re-tasted in 2013 it remains a very deep hue, its nose and palate still tight and fresh, though the cathedral spices/incense and forest floor notes have become (deliciously) more pronounced in the mouth. 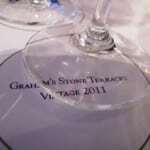 Ripe but firm, present tannins and its wonderfully mineral oyster-shell wash of acidity promise a very long life ahead. I love the pervasive smoky signature note of Baga on chalky clay soil to the finish of this wine. Bussaco Tinto Reservado 2001 – bitter and bloody. Out of condition. Bussaco Tinto Reservado 2000 – I reckon this is where the 2005 is heading. Sweet and juicy red fruited and incense spiced and, but for a savoury, bloody hint, it’s very Pinot Noir-like. 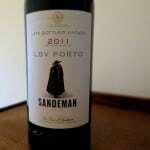 Builds to a crescendo in the mouth, its long, resonating finish lifted with floral and spice top notes. Drinking beautifully; very good. Yes, re-tasted in 2013 this vintage has a lovely sucrosity and ripe, sweet, jammy even, fruits of the forest, which are beautifully off-set by a cherry stone coolness and oyster shell minerality. A ripe but present acid and tannin structure makes for a very balanced, pleasurable wine. Bussaco Tinto Reservado 1996 – a deep plummy hue with oyster shell on the nose. In the mouth this is a serious, dry, quite closed, lean wine, with bony tannins, salty mineral and pine needle notes to its tight red fruit. Quite a contrast with the 2000, though I like its persistence and clarity it is a little unforgiving still. Bussaco Tinto Reservado 1983– the nose lacks a little purity,showing woody coffee notes. It’s better on the palate, with just a trace of coffee to its plush yet animated sweet plum and blood plum fruit. Lovely freshness lends fluidity. Enjoyable drinking. Still enjoyable when re-tasted in 2013 this sweet fruited surprisingly juicy wine reveals plum and orange peel notes with an edge of kelp. The tannins are fine and ripe. Smooth in the scheme of things. Bussaco Tinto Reservado 1982 – a coffee, camp coffee, quality dominates the palate, with has a sweet vegetal character. Disappointing. Bussaco Tinto Reservado 1964 – although it’s a little muddy with earthy, mushroom notes, there’s an elegance and lift to the 64 – lots of complexity too, with pine needles and forest floor, salty kelp and oyster shell. A fine thread of tannins makes for a long finish. 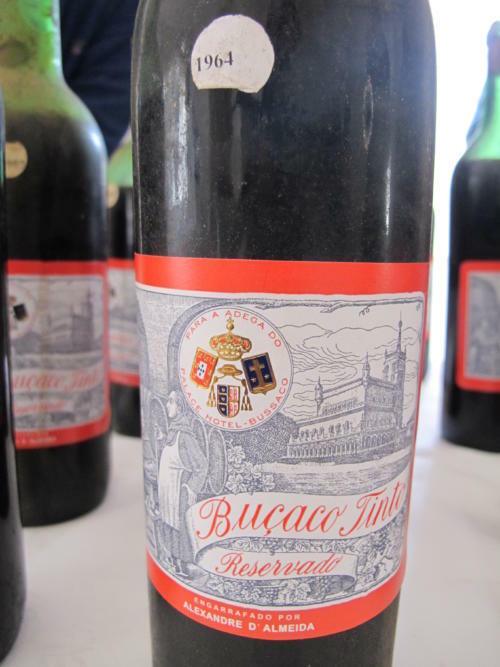 Bussaco Tinto Reservado 1960 –surprisingly floral with soapy/pot pourri on the nose which follows through on a palate that has an earthy, fern-like undertow and pronounced coltsfoot. While still retaining good structure, the flavour profile is a little odd so I cannot say I enjoyed it. Picking up more freshness, red fruits too, I preferred the 60 on re-tasting it though the sweet, floral pot pourri, incense spice and smoky lapsang notes are a little over the top/blousy. 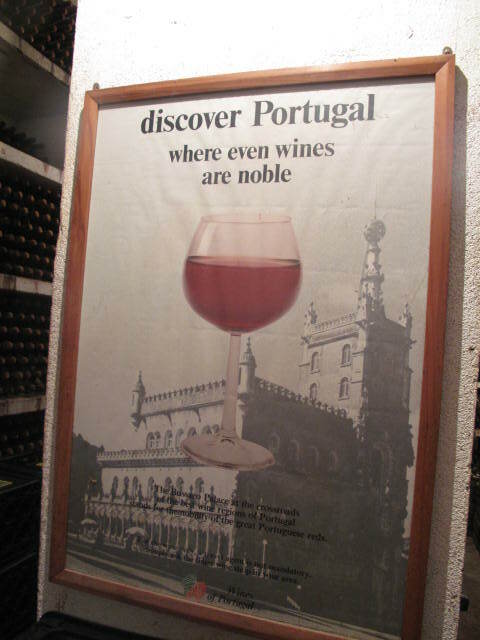 Bussaco Tinto Reservado 1959 – very tight and pinched, with coffee, fern, oyster shell and earth to the palate. A curio. Bussaco Tinto Reservado 1958 – initially I picked up chlorine (swimming pool) on the nose, which segueded into oyster shell and iodine on the palate. Holds its shape well still and, for the Bussaco’s Director Geral Antonio Rocha, it’s a terrific example of aged Baga. I think I prefer mine younger! It’s a much deeper hue than the 64, with a pronounced iodine character; re-tasted in 2013 I find it solid but uninspiring. Bussaco Tinto Reservado 1949 – very smoky – the Bairrada Baga element is alive and well in this respect, though sadly it is dried out on the palate. Past it.